Outstanding and young pianist, Julia Kociuban, a student of The Frederic Chopin University of Music in Warsaw under Prof. Piotr Paleczny, received a scholarship of society, which is a free of charge usage of Kawai grand piano. A special prize for the best peformance of Leschetizky's pieces. The Theodor Leschetizky Music Society founded a special prize of 1.000 USD for the best performance of a Leschetizky's piece during The First American Paderewski Piano Competition in Los Angeles. The laureate of this prize is Hsiang John Tu. Congratulations! The 9th Th. Leschetizky International Piano-Master Course "Idea-Image-Technique" in Rzeszow/Poland. The Theodor Leschetizky Music Society in Warsaw is pleased to invite the piano students to The 9th 'Th. Leschetizky' International Piano-Master Course 'Idea-Image-Technique' in Rzeszow/Poland. Michał Szczepański - a lecturer of the piano at Academy of Music in Wroclaw (Poland). We are very pleased having the exceptional privilege of informing that in the year 2010 The Special Guest of our Workshop will be the outstanding Polish pianist and teacher, laureate and the juryman of international piano competitions, Professor Jerzy Sterczynski - Dean of the Piano Faculty at the Music, F. Chopin University of Warsaw. The Theodor Leschetizky Music Society in Warsaw and Bemowo Cultur Center in Warsaw are pleased to invite to Theodor Leschetizky Winter Piano Academy. More info in the Projects section. 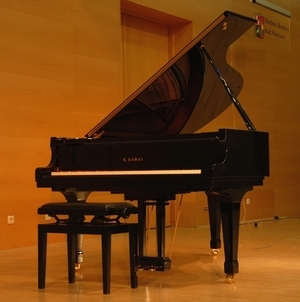 The Theodor Leschetizky Music Society has bought a grand piano Kawai RX5. A purchase was founded by The Ministry of Culture and National Heritage. The 8th International Piano-Master Course "Idea-Image-Technique" in Rzeszow/Poland. The Theodor Leschetizky Music Society in Warsaw is pleased to invite the piano students to The 8th International Piano-Master Course 'Idea-Image-Technique' in Rzeszow/Poland. We are very pleased having the exceptional privilege of informing that in the year 2009 The Special Guest of our Workshop will be the outstanding Polish pianist and teacher, laureate and the juryman of international piano competitions, Professor Jozef Stompel from the Music Academy in Katowice. 16.30 - opening of the first exhibition in Poland about Th. Leschetizky. Conception of exhibition: Piotr Kędzierski, Hubert Rutkowski. During events on October 11th will be present a great-grandchild of Th. Leschetizky - Mrs. Margret Tautschnig-Leschetizky - the president of Leschetizkyverein in Bad Ischl (Austria). Members of the Society's Board, Hubert Rutkowski and Piotr Kędzierski, go to Austria to realize a report from Bad Ischl and Vienna - places of residence and activity of Theodor Leschetizky. The 2nd scientific and didactic session: "About pianist's work"
Members of the Society's Board were guests of the great-grandchild of Theodor Leschetizky, Margret Tautschnig-Leschetizky - President of Leschetizkyverein in Bad Ischl (Austria). "An Attempt to Confront the Theodor Leschetizky's Teaching Method with the Contemporary Pianism"
Hubert Rutkowski delivered a lecture entitled ‘An Attempt to Confront the Theodor Leschetizky's Teaching Method with the Contemporary Pianism’ (at a scientific conference, ‘ (The Problem of Value in Reflection on Polish Music organized by The F. Chopin Academy of Music in Warsaw). The Leschetizky Music Society in Warsaw established a contact with some Leschetizky Societies abroad (,Leschetizky Society in New York), Leschetizkyverein Vien, Leschetizkyverein Bad Ischl and Japan(Leschetizky Society of Japan in Tokyo). Foundtation of The Leschetizky Music Society. The Leschetizky Music Society was founded in Warsaw. Among the founders, there were people who represent many spheres of art and science, among others: musicians, actors, philosophers, journalists and economists.